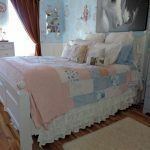 Shop for vintage style linens and bedding for a shabby chic cottage inspired bedroom and pamper yourself. Envelope yourself in crisp vintage bedding in soft floral prints and chenille. I love the look and feel of vintage cotton linens. I am always on the lookout for beautiful pieces at local flea markets. I sell some of my treasures “as is” but love to make things from the vintage fabrics I collect. You never know what you may find in my little linen shop! 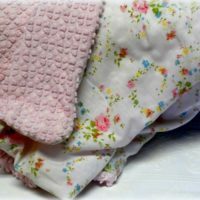 Here you will find vintage sheets, pillow cases and chenille bedspreads, just like the ones Grandma had when you were little. Nothing feels better than wrapping yourself up in soft chenille or slipping under cool crisp cotton sheets! Vintage linens can give a room a feeling of nostalgia and remind you of the Good Old Days when life was not so hectic. A bedroom should be a haven. A place to rest and relax and it should look pretty too!